The URL here is http://anilbh.tripod.com/meerut. Another URL is http://meerutup.tripod.com in case of inaccessibility. Yahoo vs. Google : Here is a test try these two terms in both Yahoo as well as Google. They are "meerut" and "coronation durbar" . You will find "meerutup.tripod.com" in the first page in Yahoo for both the terms. They are completely missing from Google. Strange because Google used to give a similar ranking. Is there such a drastic change in Google's ranking algorithms that a site completely disappears from the listing? I have not used Google for months now. Sunrise/Sunset for 13th April Twilight start - 5:30am Sunrise - 5:56am Sunset - 18:18pm Twilight end - :18:44pm. Meerut Latitude : 29.0 deg N, Longitude : 77.5 deg E.
Many residents have received letters increasing their house tax by not just a few per cent but by more than 300% . No grounds given only a time period for objections. The increase in tax is entirely arbitrary and certainly never improves facilities. The drains are choked even the main one called 'Abu Nala' which prevents the smaller drains from flowing. Roads broken. Electricity erratic. Municipal services barely tolerable. By the way the tax is based on rental value . Rental value of purchased property? Used by the owner? That is why we are called Incredible India. And what is a the rental value of at least one place? Over 31 lakhs of Rupees!! Increased to over 100 lakhs. Nobody has ever received anything in return for these exorbitant Taxes. Forget the fact that nobody in Meerut can pay that kind of rent. In the late 90s the tax was of the order of a few thousand Rupees now it is in lakhs ( 1 lakh=100,000). Want to see where Santa is right now ? Click here. Is called Shahid Divas now. 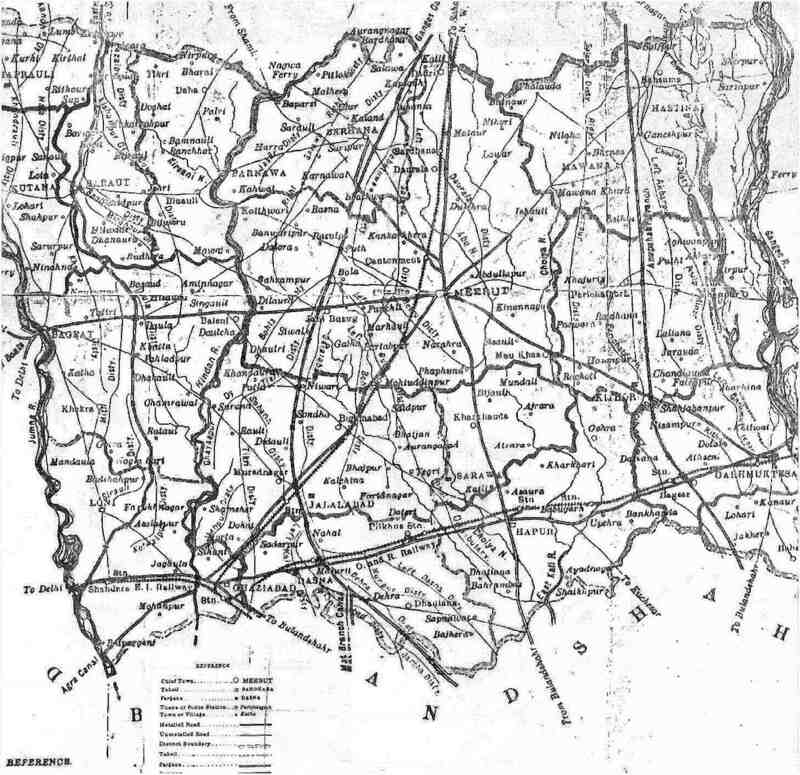 The Gaddar started in 1857 on the 10th of May 1857. 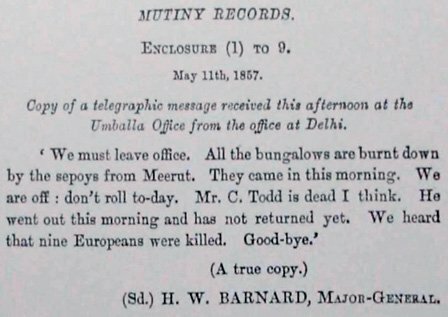 The transcript of a telegram sent from Delhi to Ambala is on the right. Things to note about the 'Sepoy' Mutiny. Indian Soldiers were called Sepoys. Every Sepoy came from a farming background and knew the indignation which was widespread in the rural areas regarding the East India Company 'Taxes'. These were collected with European efficiency and were accompanied with penalties which Indian Rajas and Maharajas never implemented. Land could be and was confiscated for non payment. A small booklet was published in 2007,(it was available on the Mutiny train ) and gave a short list of some of the bigger conflicts between the rural population and the East India Company Army. They happened from the 1760s to late in the 19th century. Yes much after the Mutiny. Takes place in the first week of May every year, not sure if it is always 7th May. It is a a penance activity. Meaning a certain amount of suffering is to be expected. A good assumption since things are heating up around this time of the year. However today(7th) it will be different the weather is actually pleasant since it rained in the evening. 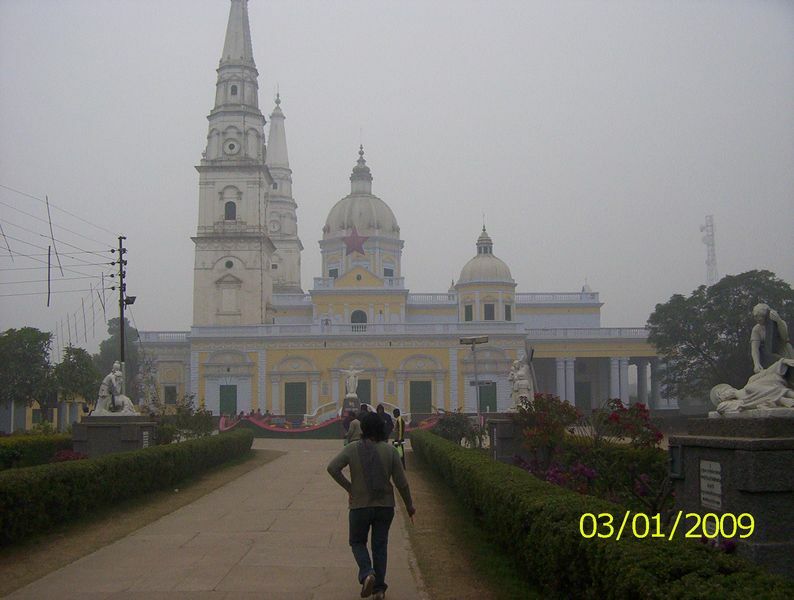 You may know that Sardhana has a Church built by Begum Samroo in the early 19th century. The distance from the Catholic Church here is a little less than 20 km. They start after 10 pm. You can see a Cellphone tower in the picture. I am not sure what is the state of the Electricity here. Did not see a water tank. So assume there is not tapped water in the area. In many ways things maybe worse than the early 19th century as the population is much more! The usual route from Meerut is via Kanker Khera, avoid this as 80% of the road does not exist. Has been like this for months. Go via Daurala longer but much better road. Could be the largest block of carved marble in India. Made in Italy. Reached when there were no trains and trucks. Somehow forgot to post this. Really of interest only to Cantonment residents. On the 20th of September 2010, a news item appeared in the Danik Jagran stating that the oldest school in the Cantt. - St. John's - was going to be put up for auction on October 4th. Along with this some other schools were mentioned as not having paid up varying amounts running into lakhs. At least one school City vocational deep in the Cantonment was left out. Included in the amount St. John's was expected to pay was something called a Water Tax and the school does not even have a water connection. The other amount was a colossal House tax. The taxes are supposed to help in maintaining the cantonment. Take a look at the Abu ka nala near Bombay Bazar and the bridge over it. The bridge has been an eyesore for decades. Not a sign of maintenence. No St. John's was not auctioned. The point to note is that the Principal never even got a notice. The school is walking distance from the Cantt. Board Office. There are a lot of Govt. officials on the Board whose main responsibility is the Cantonment. A note about Cantonments - they were all established by the East India Company while it was still in power before 1857. Buying and selling property became impossible only after 1977. This was the work of the short lived 'Competent Authority'. Cantonments always contained Bazars, private property, hotels,Cinema halls . They contained the Military establishments they were not owned by the Military. The decay started from that time only. Administration does not mean ownership. The stone slabs declaring that the Land is Defence land came up after 1977. The latest is this they are cutting of water supply to the Bungalow area. We don't need a Tsunami for disasters. Could be of interest to residents of other Cantonments. There are such few pictures of the Raj just before Independence. 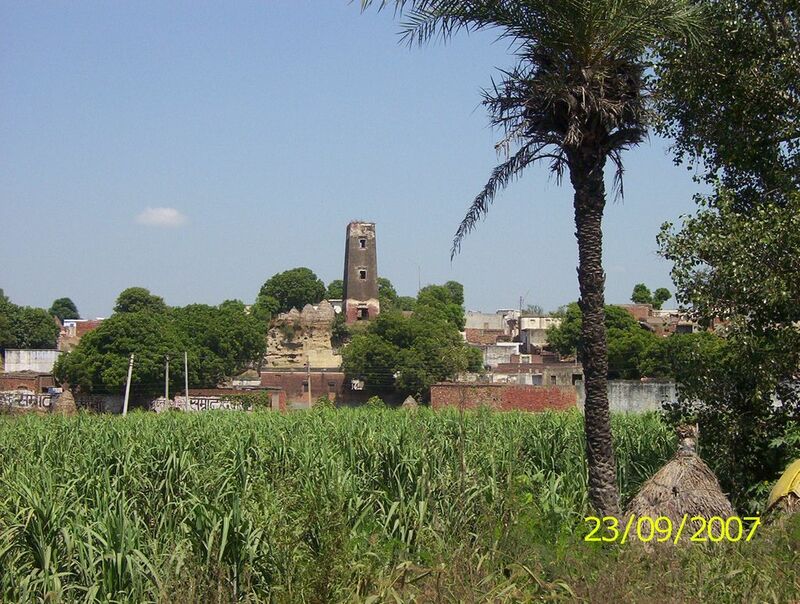 The tower in Saini village which was constructed during the Great Trigonometrical Survey. The Survey started in the early 19th century, lasted a 100 years. Mount Everest was discovered during this in 1851.Curious about the Survey ? You could search for a document called Full Text of Account of the Operations of the Great Trigonometrical Survey of India Volume XVII.htm.This mentions that about 3700 were built in the entire country. About 3000 remained when the text was written. The Survey started at Cape Comorin. Note : On some pages midi(music) files may play they will not delay you much but the sound may surprise you. MEERUT is an ancient town , but little literature about it is available . Any information mythical, factual, or hand me down stories preferably specifically related to your ancestors are welcome. Contact address is at the bottom of page. To come back to this site look for Meerut in Yahoo regional directory. 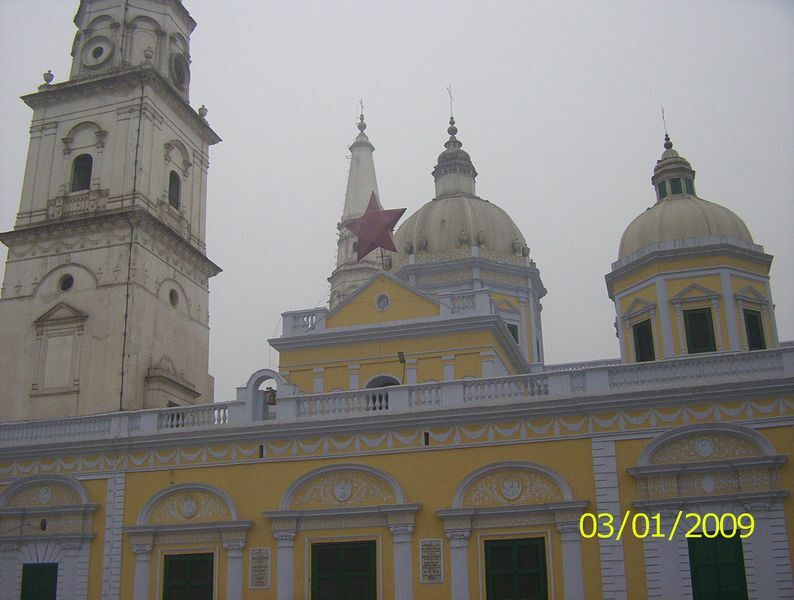 It is not generally known that Meerut was one of the 16 major towns of Ashokan times . An Ashokan pillar was erected here which means that this was a major Buddhist center . This pillar was shifted to Delhi Firoz Shah around 1300 AD. For the uninitiated the Ashokan Period (a short historical note) dates at around 256 BC. About 75 years after Alexander's ( Sikander in Hindi ) invasion of the Punjab. Don't know what Ashoka wrote about ? Then checkout the translation of all his Edicts by clicking here . The picture which best represents Meerut is the spectacular Chaudhary Charan Singh University (CCSU) Gate. It is no easy job to label the style . Futuristic ? Modern ? Indian ? Western ? Ancient ? Rural ? Urban ? Take a good look, it is perhaps all of these. The pillars go all the way back to ancient Greece or Rome. And the security cabins? A roof under a roof ? It is perhaps the only one its kind in the world. Help !! Talking about labels.. why should one have a neat label for everything ? And as usual the name of the architect to whom the honours go is not easy to find. Not to a casual observer at least. 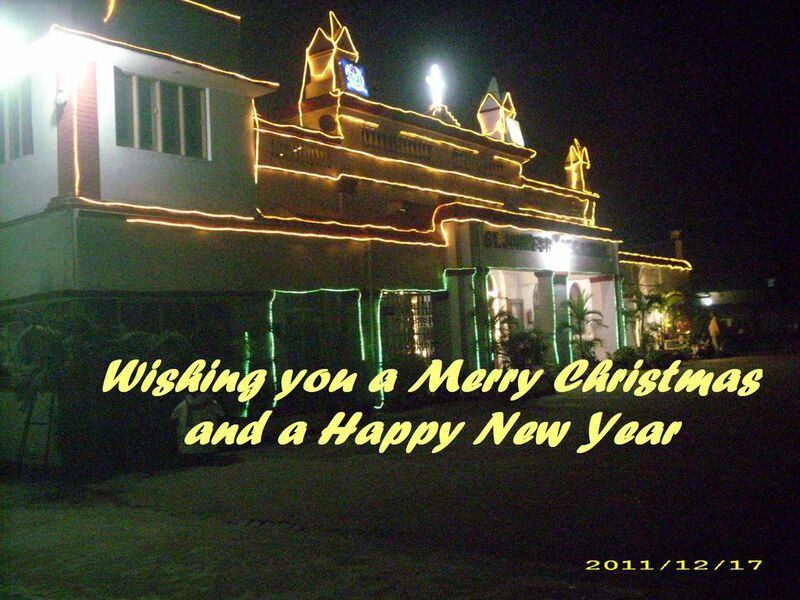 That is Ghantaghar in the picture on the left. Easily the most magnificent structure in Meerut. 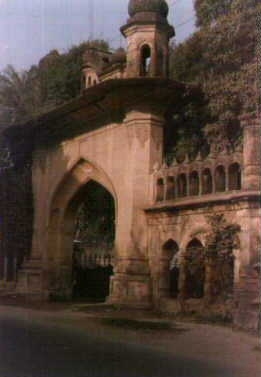 Built by the British in 1914, in place of what used to be Shambu Darwaza(Gate). The window on the left looks out from a little room on the first floor where the old man the keeper of the big clock lived and ran a little shop for clock repair. He died in the early 1990s. Sure enough the big Clock stopped.. short.. when the old man died, nobody rewound it. It is a great change from the open and vacuous Cantonment area. Need a Calculator cheap clock transistor radio or want to get a mechanical/pendulum clock ( yes even Grandfather Clocks) repaired then this is the place. Further down is Lala ka Bazaar - ideal for cheap toys in bulk for Christmas trees, Birthday party favours, all sorts of plastic and glass jars are also available. This milestone is about 400 meters north of Begum Bridge. 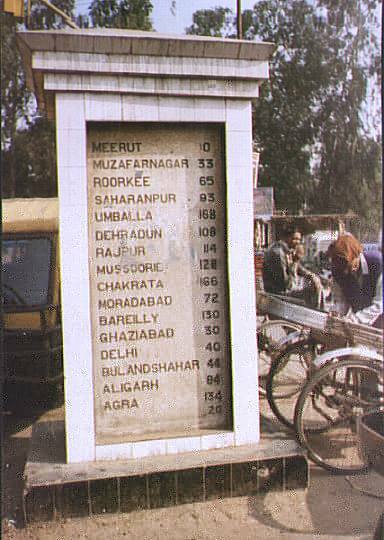 This area is now known as the Zeromile point after the Meerut Cantonment Board very graciously looked up its records and put back the names which had become invisible on this, well, signpost. The distances are in miles. Some facts and figures about Meerut. The latest census puts it in the above 1 million category. It has about the same population as Indore, Faridabad, Thane. 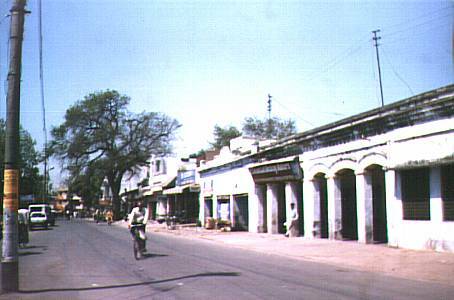 It is the 24th largest town in India (populationwise), and the 4th largest town in UP after Kanpur and Lucknow, and Agra. 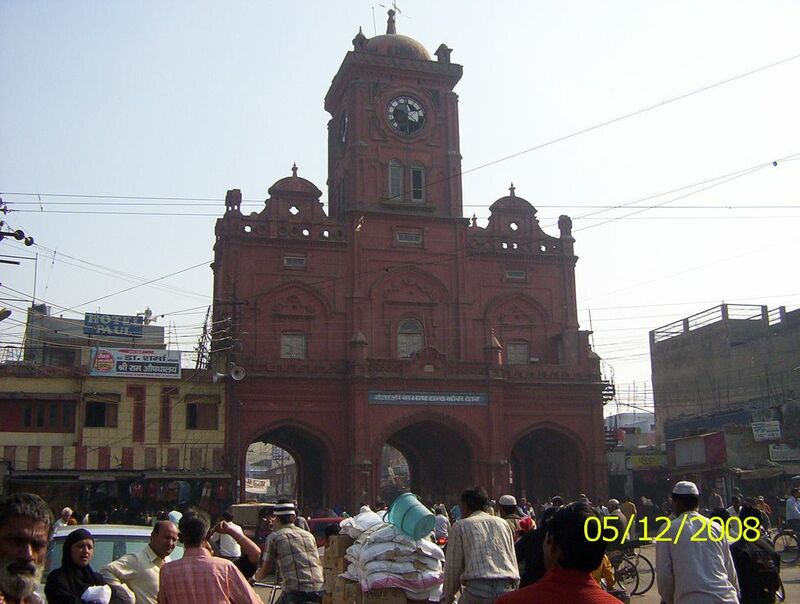 Kanpur is larger than Lucknow with a population of 2.5 million. It is about 6 hours drive from the Taj Mahal Agra and Fatehpur Sikri. It is less than 50 Km from Hastinapur the seat of both Hinduism and Jainism. Haridwar - in the region where both Ganga and Jamuna enter the plains - is a little over 100 km. and local sources for hardware, best prices etc. The entrance to Mustafa Castle is shown below. Belongs to the family of Nawab Ismail. One of the sons was a signatories of the Indian constitution. There is a huge photograph of all the signatories of the constitution in the main room. It is not a public place . I am one of Nawab Ismail Khan's grandsons. I've been in the U.S. for almost thirty years, but have been back to Meerut a few times. What you refer to as the Grand Home is actually called Mustafa Castle. 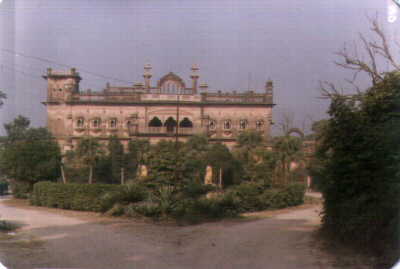 Built by Nawab Ismail's father, Nawab Ishaq Khan, and named for his father, Nawab Mustafa Khan Shefta. Shefta was a contemporary of Ghalib's and a prominent poet in his own right. My memories of living there in the 50's and 60's are wonderful ones. Of witnessing the end of a golden and opulent era. When the Nawabs and Rajas lost their estates, titles and lands, the mansions could not be kept up. It is almost sad to visit this once wonderful castle, in it's present state of disrepair. Somebody told me about your site, and it brought back a few memories. Dr. Kuraishy's e-mail is : kuraishy@sbcglobal.net. I have included a reply from an uncle of Dr. Kuraishy in Pakistan. You have to click the link in the text adjoining the next picture. Perhaps the Grandest old building in Meerut. It is called Mustafa Castle. 'Palace' may not be off the mark . Still occupied by the descendants of the original owners. The Drawing room is retained in its original layout as a tradition . Among many antique items is an old floor standing candlestand , which can hold 7-8 candles . Still used because of a very unreliable electric supply. 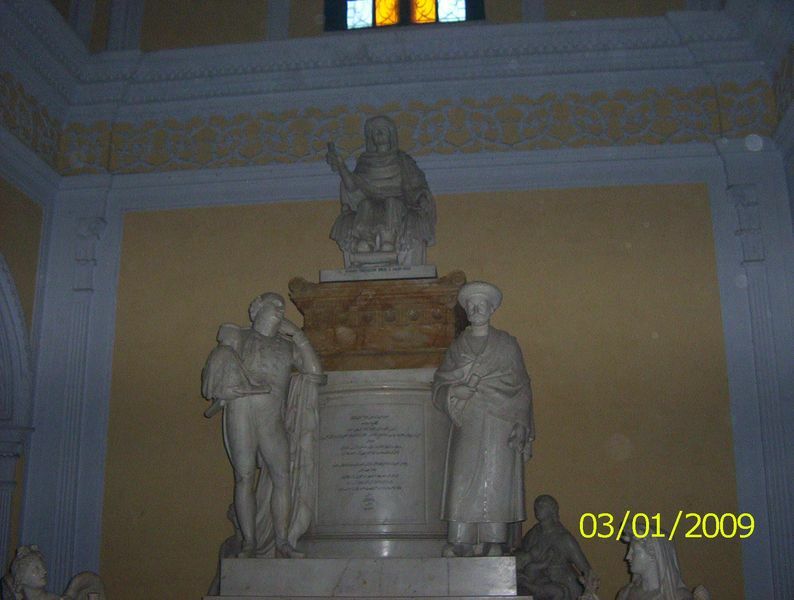 It has been visited by Mahatama Gandhi,Sardar Vallabhai Patel, Nehru, Jinnah. Click here to read further details about Mustafa Castle sent by Mr. Iftikar A Khan in Karachi. No text about Meerut can be complete without a reference to the Mutiny of 1857. Click here for some notes. Use the Browser back button to come back here. Move mouse over the descriptive text to change picture. Just bring the mouse to the side of the list of pictures below for pictures to change ( please wait about 5 secs on a dial up connection). The CDA Building( Belvedere ) used to be a Club around 1880 or so. Bombay bazaar, old construction it seems . If you look carefully at the top of the row opposite this side you can spot the remains of the Imperialistic crown. Ganga Plaza . 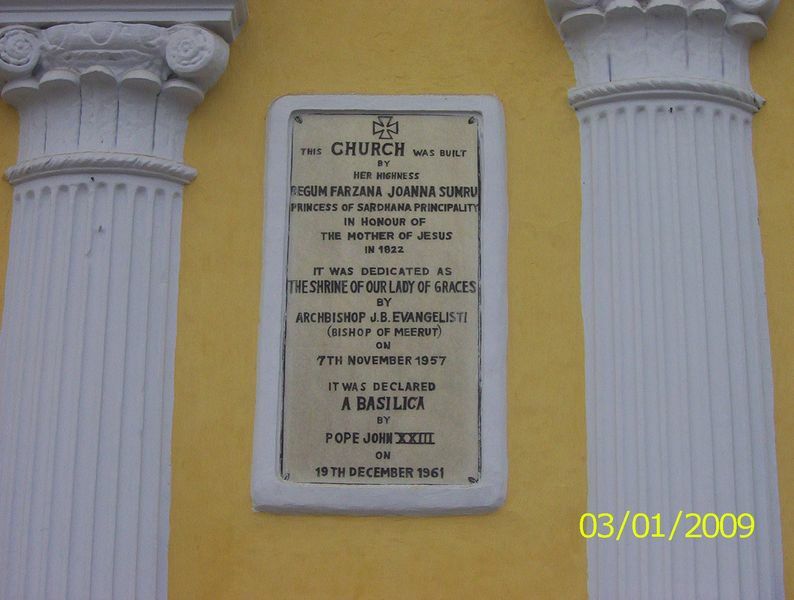 Named after the daughter of Dr. Brijraj Singh son of Dr. Bhopal Singh. The nursing home and huge bungalow was replaced by this complex. You can dabble in shares with Reliable Investment and Demat services. Has an underground air conditioned shopping complex. Dominos opened here with great fanfare but could barely last one year. There is no great rush for westernized stuff. You have to be careful about being too slick here. There are many other shopping complexes here but none with the air of Ganga Plaza. Jolly Stores - In Sadar Bazaar easily the most well stocked store. You get everything here. No, no, no Aircraft carriers, no Battleships, no 747's - no space you see, but other things , yes. Some houses A well maintained old design at Eastern Kutchery Road. Some people are doing quite well thank you. The mess is evident only when you direct your attention to areas of Government responsibility - Electricity, Drainage,Roads, Govt. Offices, Courts and Garbage disposal ( the rare garbage bin is seen only near Govt. Employee housing - Civil Lines , Army areas etc. ). You cannot blame the current incumbents for this problem. This (the penchant for directing public money to benefit Government minions is a legacy problem, going back to Shahi and Colonial times) any benefits to taxpayers (the entire population - not just 10%) was always in the form of spillover. However there has been a distinct degradation of municipal services in the last decade or so. At Defence Colony. Omissions just mean that I dont have pictures of many more beautiful houses all over in Saket, Pallavpuram,Shastri Nagar .. The most impressive new house ? Just go and see the one opposite the Arya Samaj Mandir near Gole Market in Saket. Is it also a home?